Congrats to the VRMCA 2019 Mixer Truck Roadeo Winners! Another successful VRMCA Concrete Mixer Truck Roadeo is in the books! This year’s event was held Monday, April 15th at The Meadow Event Park in Doswell, VA with a total of 25 drivers from all over the state participating – a new attendance record for the event! A big “Congratulations!” to Juan Del Pino from Vulcan Materials Company for earning top honors! As the first place finisher, he takes home a check for $500 and receives a free trip to the VRMCA 2019 Spring Convention May 5th through7th at the Hilton Oceanfront Hotel in Virginia Beach, VA. The VRMCA Concrete Mixer Truck Roadeo was established to offer a fun, competitive environment for mixer truck drivers to show off their skills and knowledge. The event kicked off with a written examination that included 50 multiple choice questions. The drivers then took part in a quick safety presentation conducted by Andrew Wren of Vulcan Materials Company on the importance of three points of contact. Drivers then worked their way through the final two events: pre-trip truck inspection and the driving challenge course. Results for the three events were combined to produce each individual driver’s total score. Prizes are offered to the top two finishers in the event. 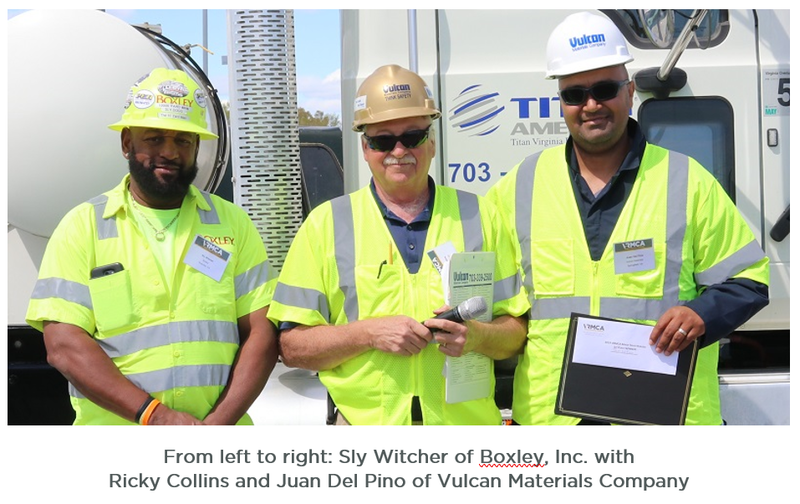 Second place and a check for $350 was awarded to Sly Witcher with Boxley, Inc. out of Roanoke. Many thanks to all work worked to make this event a success, including the more than 20 volunteers who showed up to lend a hand on the course and cheer on all the drivers. And last but not least, a special “Thank you!” to Vulcan Materials Company and Titan America for donating trucks for the event!